Are you on or taking a camping trip and looking for easy campfire recipes? 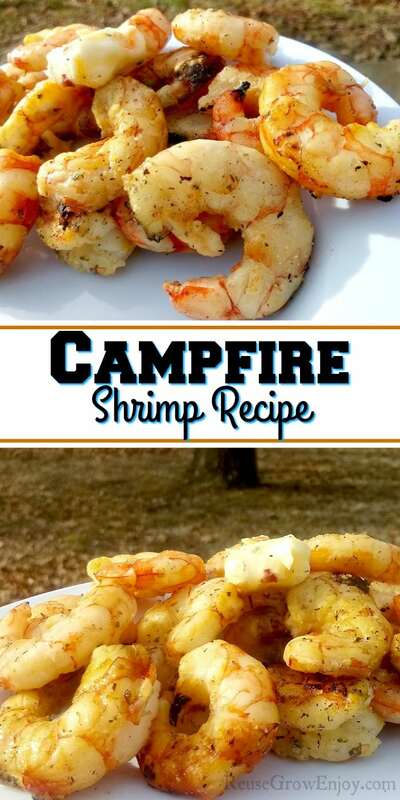 I am going to share this super simple campfire shrimp recipe. This could also be made at home. Coking over a campfire is one of the best parts about camping. Something about the flame from the fire just gives food so much more flavor. 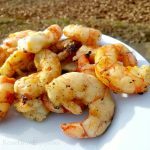 If you are a seafood lover, then make sure you try this campfire shrimp recipe they next time you are camping. Never cooked over a campfire before? Then you may want to check out my post on Camp Cooking Hacks On Over The Fire Cooking. If you need more recipe ideas, there are a lot of campfire recipes here. While the recipe below is made over a campfire, you could also make it on a grill. That means these could also be made easily at home. 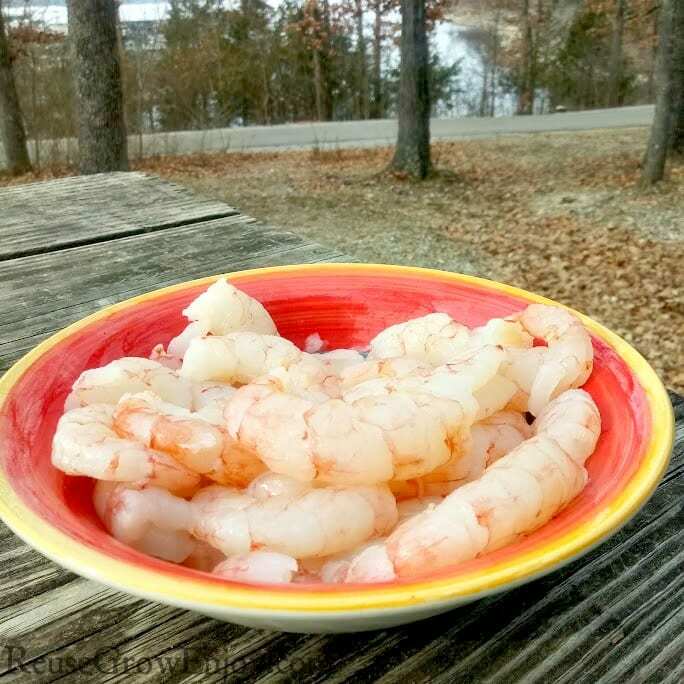 That way you can enjoy some shrimp at home even if you are not going on a camping trip anytime soon. While making this recipe, Argentina shrimp was used, but feel free to use the shrimp of your choice. Also, while the recipe gives you an idea of what you will need to make it, you can use more or less of the ingredients to fit your taste. Or to make for a larger group. The first thing you want to do is start defrosting and thawing the shrimp according to package directions. Then give them a fast rinse and drain. 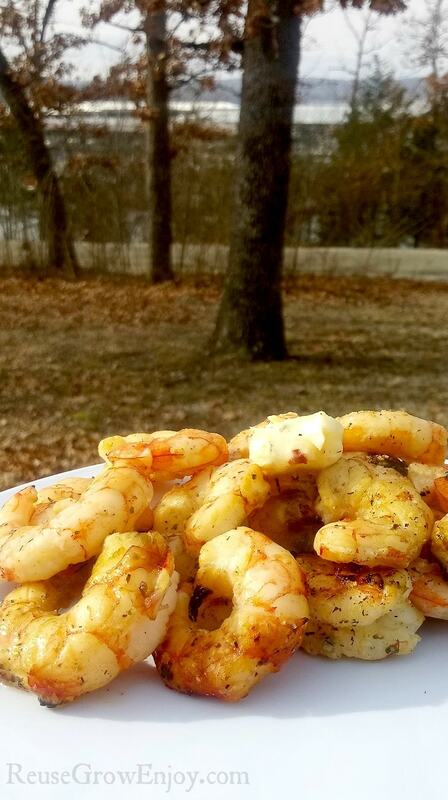 While the shrimp is thawing, start your campfire. After you have it going, place the cooking grate or grill over the campfire. You will want to spray lightly with cooking spray on half the grill before putting it over the campfire to help prevent sticking. Before placing the grill on top of the campfire you will also want to put foil on half of it to rest the shrimp on later. To get grill char marks on your shrimp, take your raw shrimp and place on the side of the grill that you sprayed with cooking spray to sear one side. Watch carefully and don’t leave on too long because you don’t want to overcook. Repeat to sear the other side of the shrimp. Once they reach around 135 degrees Fahrenheit pull off the shrimp and place on the aluminum foil on the grill. Apply seasoning and butter and cover till shrimp are cooked. To cover, create a tent using aluminum foil and cover so that they can continue to cook slowly. Watch for them to curl slightly or use a meat thermometer 145 degrees Fahrenheit or 63 degrees Celsius to make certain that they are cooked all the way through. When they are fully cooked, remove from grill and serve. They are great as is or you can serve with a few veggies on a tortilla to make soft shrimp tacos. Thaw the shrimp according to package directions. Then give them a fast rinse and drain. While the shrimp is thawing, start your campfire. Lightly spray on cooking spray on half the grill. On the other half, cover it in foil. Then place the grill over the fire. After shrimp is thawed, place on the non-foil side of grill char marks on your shrimp. Watch carefully and don't leave on too long because you don't want to overcook. Repeat to sear the other side of the shrimp. Once they reach around 135 degrees Fahrenheit pull off the shrimp and place on the aluminum foil on the grill. 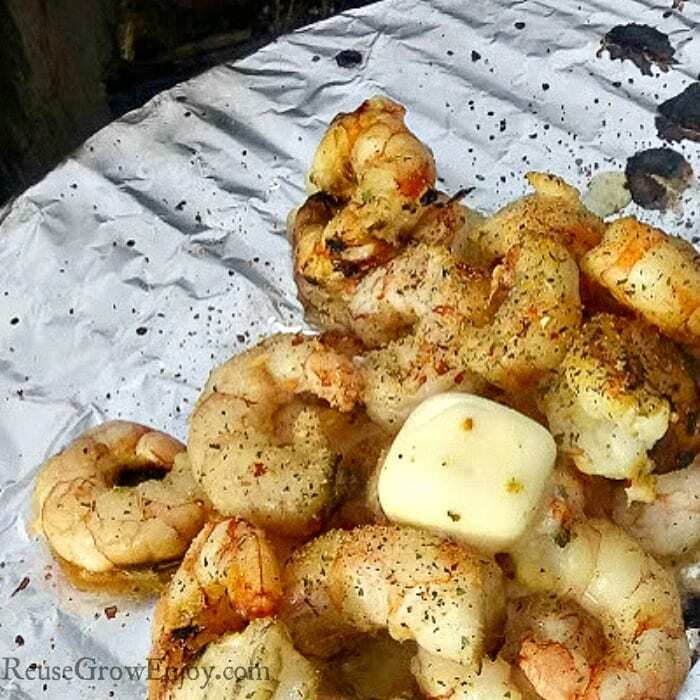 Apply seasoning and butter and cover with a makeshift foil tent till shrimp are cooked. Watch for them to curl slightly or use a meat thermometer 145 degrees Fahrenheit or 63 degrees Celsius to make certain that they are cooked all the way through.